The Coalition for Jewish Values (CJV), representing over 1,000 traditional rabbis in public policy, saluted Rabbi and Mrs. Mendel and Nechama Hendel, Chabad shlichim (emissaries) in Athens, Greece, for their efforts on behalf of 200 Jewish passengers forced to spend the Sabbath at Athens' Eleftherios Venizelos International Airport. Prolonged delays required El Al Flight 002 from New York to Tel Aviv to divert to Athens Friday afternoon, Nov. 16, to avoid desecrating the holy day should they have continued on to Israel. Although the Hendels learned of the situation only at 11 AM local time, Rabbi Hendel and his team swung into action, arranging meals and a memorable Shabbos for the stranded passengers at the Sofitel Hotel. 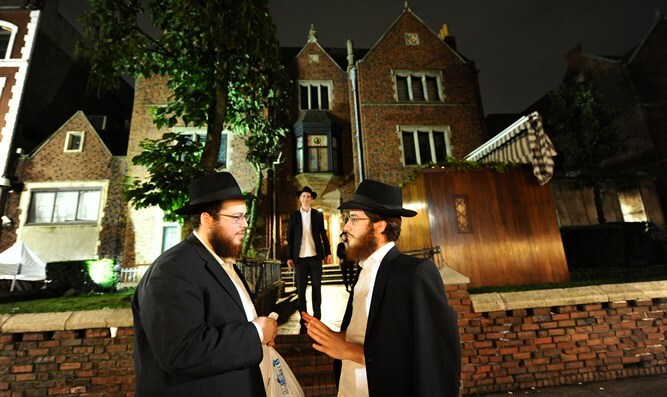 The Hendels and their young son stayed at the Sofitel, leaving the assistant rabbi at the Chabad House with their 130 previously-scheduled guests. "One must appreciate the tremendous service provided by Chabad and its emissaries around the globe," said Rabbi Yoel Schonfeld, Vice President of CJV. "No matter where a Jew finds himself, he can count upon Lubavitch shlichim to help. Furthermore, this episode reminds us that no matter what our differences, we are truly Am Echad, one nation under G-d."
Last Thursday, hundreds of passengers waited at New York City’s JFK airport for El Al Flight LY002, a direct service flight from New York to Israel’s Ben Gurion International Airport. The flight had been scheduled to depart at 6:30 p.m. Thursday, but was delayed after several crew members were late in arriving at the airport – reportedly due to snow storms. The plane was ultimately boarded, according to a witness, at 8:30 p.m. Thursday, and by 9:10 the plane’s doors were closed. As the hours passed, however, passengers became anxious, asking staff members when the flight would depart, and if it would arrive before the start of the Jewish Sabbath in Israel. El Al claimed a number of haredi passengers became violent at this point and attempted to force their way off the plane. When the plane finally departed, more than five hours after the scheduled departure time, the pilot assured passengers the flight would arrive in Israel before the Sabbath. During the flight, however, the captain informed passengers that the plane would be stopping in Athens to drop off any passengers who wished to ensure that they did not violate the Sabbath, while secular passengers would continue on to Israel, arriving after the beginning of the Jewish holy day. Initial reports after the plane landed claimed that religious passengers had “rioted” on the flight after it became clear the plane would not arrive in Israel before the beginning of the Sabbath. News of the alleged violence by religious passengers went viral on social media outlets. But passengers denied the claims, saying that at no time did any of the roughly 180 religious passengers on board the flight ever use violence or attack the flight crew, and pushed back against allegations haredi passengers had attempted to break into the cockpit. It was discovered that the rioting incident never happened, and that responsibility for the aggravation was that of El Al alone. There was no physical violence. El Al decided to land in Athens and told passengers they would arrive before Shabbat when the delay was due to the fact that their air crew was a few hours late for the flight. The Coalition for Jewish Values is the largest rabbinic public policy organization in America, and articulates and advocates for public policy positions based upon traditional Jewish thought.